I was reading up on classical guitars recently. I’ve never owned a classical guitar. However, we had dinner at a friend’s house a few weeks ago and I was playing his Guild Mark IV classical guitar. Very nice. Why don’t I have a classical guitar? Now I want one. Most classical guitars describe their scale length in millimeters (mm). The most common scale length for a classical guitar, particularly low to mid priced guitars from well known companies is 650 mm. I wondered how that compared to the guitars I know. So here’s a table comparing decimal inches to millimeters along with the scale length of some common or well known guitars. There is some rounding in the table. Also, Martin and others changed the way they expressed their measurements sometime back. They now express scale length in decimal inches instead of fractional inches (such as 24 5/8th). It isn’t clear to me whether they actually changed dimensions (unlikely) or are just living with the inherit rounding from the change to decimal inch measurements. How do you measure the scale length of a guitar? I’ve seen some recent web advice regarding how to make this measurement where the authors thought you should measure from the nut to where the strings cross the saddle. If you are building a guitar you’ll need to know how to make such a measurement in order to properly place the bridge and saddle. But right now, I’m talking about determining the scale length of a guitar you own or want to buy. The easy way to measure the scale length of any fretted instrument is to measure from the edge of the nut facing the finger board to where the string touches the 12th fret when fretted. This is half the scale length. Double the length and you have the answer. Measuring scale length on my Washburn J6. 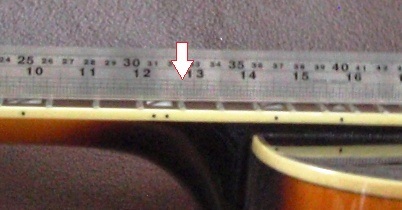 Arrow shows distance to 12th fret is approx 12.75 inches. Scale length is 25.5 inches. The saddle is (or should be angled) so the length is different for each string. 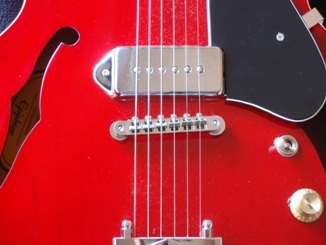 Many guitars have “compensated saddles” where individual string adjustments can be made (usually electric guitars) or at least each string length is different. If you don’t measure down the center of the fingerboard you will end up with a different measurement because the string spread (width between highest and lowest string) is greater at the bridge than at the nut – thus the length (ignoring the effect of my first two points) is longer for outer stings than center strings. Nice and informative article. Now I know how to determine my classical guitar scale length. Thank you so very much. You’re welcome. I’m glad you found the information useful. Thanks for the feedback.